One of our brilliant volunteers from our monkeys programme, Jana, has shared what arriving at the project is like and also some of her top tips. “I went to the monkeys project during September/October 2015. It was a long flight to Johannesburg, but since it was an overnight flight, it wasn’t too bad. You want to make sure to get money before you check in you luggage for the connecting flight. There is no ATM after you pass the security area. The connecting flight to Phalaborwa was in a tiny airplane and it did take some courage to go on that plane. From the plane you get a pretty good view of the biggest man-made hole on earth (at least according to Wikipedia) where they collect copper from. Phalaborwa has the cutest little airport I have seen in my life, so make sure to have your camera prepared before landing. When we got to project site, we were greeted by the dogs Impy, Penny and Duke (those three were our guard dogs for the night), Chloe, Prince, Lady and Lizzy Oh and Bob and Lynne were there too of course ^_^ . Our luggage was taken to the dorm and we got a chance to freshen up and to start our tour of the farm. We were shown the different enclosures (Big Baboon enclosure, Samangos, Vervets, Teenage Baboons and the babies) as well as quarantine and clinic. Later on during our stay we also got a pig named Missy (which I am sure you will meet when you get there and when you do, please feed her an apple from me and pay some attention to her. She really, really likes a good belly scrub) as well as two donkeys. Before dinner we still had time to spend some time with the baby bunch: Toby the vervet, Khaleesi the samango and Blossom and Barney the two baboons. Unfortunately, Blossom did not take a liking to me at all. She was terrified, for whatever reason, and was screaming and twitching every time she saw me, even if it was from afar. As a note on the side, she did come around after 19 of my 21 day stay and finally did her funny laugh with me. 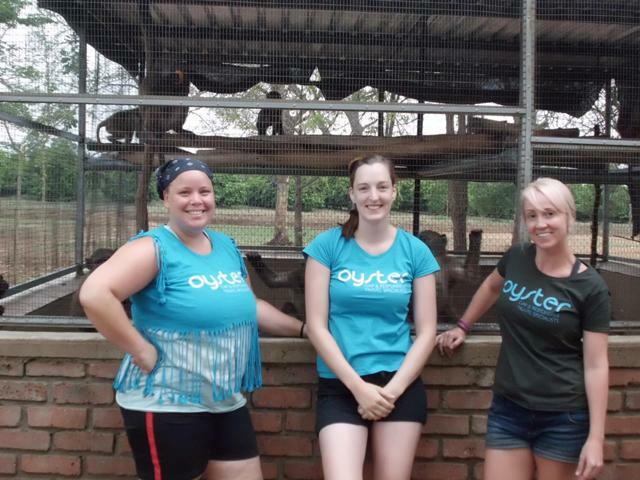 Check out our website if Jana’s tips have whet your appetite for volunteering with monkeys. Next Post The Great White Shark – deadly villain or simply misunderstood?